Kherson is located in southern Ukraine on the right bank of the Dnepr river. The city was founded in 1778 by Grigory Potemkin. It was the cradle of the Black Sea merchant navy. Kherson is a large sea and river port today. 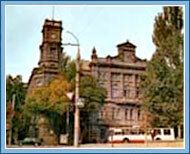 There are two museums in the city - the Museum of Local Lore and the Arts Museum. Kherson also has a Philharmonic Hall, a Puppet Theatre, Music and Drama Theatre, as well as numerous architectural monuments. The exhibits of the Arts Museum include paintings from the 18th through the 20th centuries.